Another Beautiful Day in Paradise. We had fairly clear & blue skies with temperatures in the mid to upper 60s with a little NE breeze. 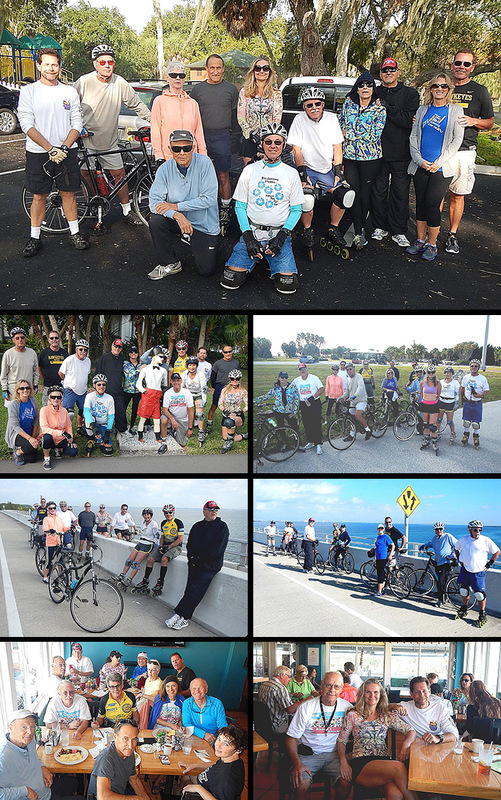 Bladers/bicyclers Roy H, Jay B, Dee T, Rick P & Ginnie S, Steve G, Bob H, John C, Gail B, Carol J, Jeff B, Lady B, Bruce M, Raluca M and Kim F came. Jay and Gail B are new to the area. Bob & Raluca and John were here for the Pinellas Trail Skate. Welcome all. We did our regular Ft. Desoto route with Kim and Dimitri going on and doing the North end. Kim and Dimitri did 19 miles and the rest of us did 12.3 miles. We had 8 bicyclers and 7 bladers. We Brunched at the Island Grille as planned. John L and Joanie C joined us for Brunch. We got right in and seated at 3 tables. Service was good, the coffee flowed freely and the food was very good. We gave the Island Grille a 9.7.